Yesterday proved to be the most exhilarating day of our trip so far. There’s still a chance, however, that yesterday will be topped. We are only a little more than midway through an 8-day, 7-night trip on AmaSonata, traveling from Prague to Budapest. Each day holds its own surprises. One intriguing day is still ahead, a 70-kilometer ride from Vienna to Bratislava on Saturday. We’ll pedal from the river cruise docks in Vienna, along the Danube, through what was once the Iron Curtain and into Slovakia’s capital city. Our ride yesterday was through the gorgeous Wachau Valley. 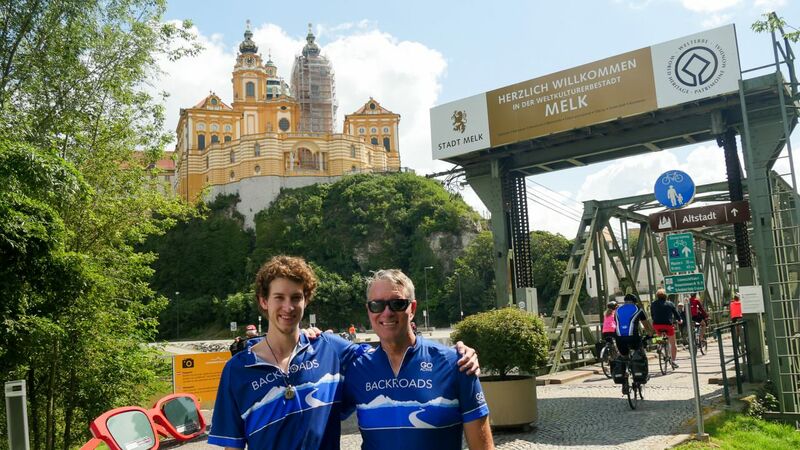 The morning began when AmaSonata docked in Emmersdorf for the sole purpose of letting our group of 20-plus cyclists off the ship so that we could pedal to Melk. 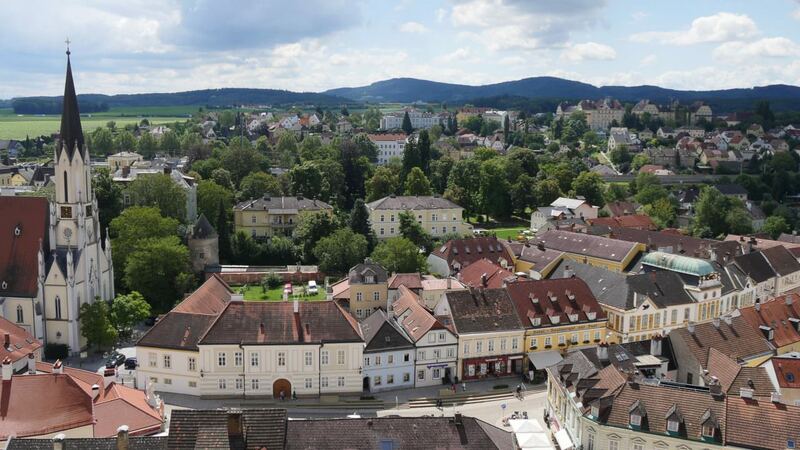 Emmersdorf is a small town situated directly across the Danube from Melk, but our route took us upriver and across a bridge and then back into Melk, a distance of about 18 kilometers, a good warm-up ride for the day ahead. In fact, Backroads has covered nearly all incidentals on our trip, including the costs of ferry crossings by bike and also lunches. 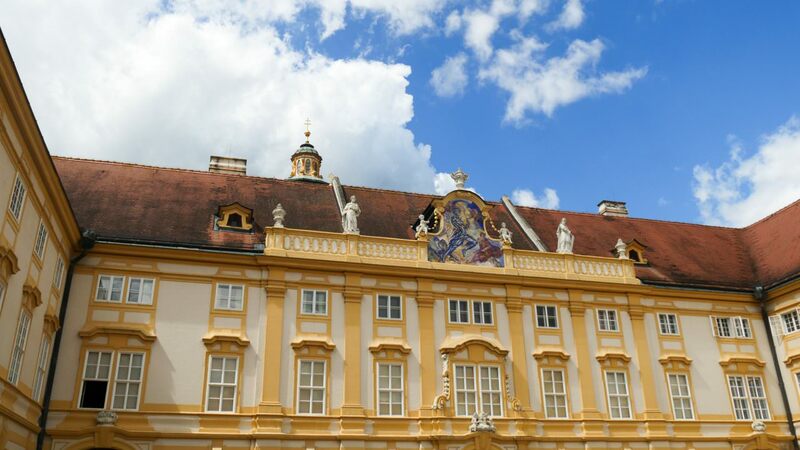 Yesterday, after visiting the Melk Abbey, we had lunch at Hotel-Restaurant zur Post. Alex and I ordered the Wiener Schnitzel, which was excellent. I was impressed that we were able to order from the menu rather than having a set menu or buffet. Backroads imposed no limitation on what we could order, including beer and wine. One of the things that I have come to appreciate about Backroads so far is that we have so much freedom and flexibility. With Backroads, and also with AmaWaterways, we are not being pigeon-holed into someone else’s idea of what our vacation should be. Also impressive is how little – and how much – we can be part of the group. We’re not being herded like cattle on tours and activities. Rather, we are given an abundance of choice. Each evening Backroads delivers a one-page information sheet providing details about the following day. The sheet is colored (yesterday’s was yellow) so that it is easy to differentiate from “The Daily Cruiser” that AmaWaterways provides each evening. 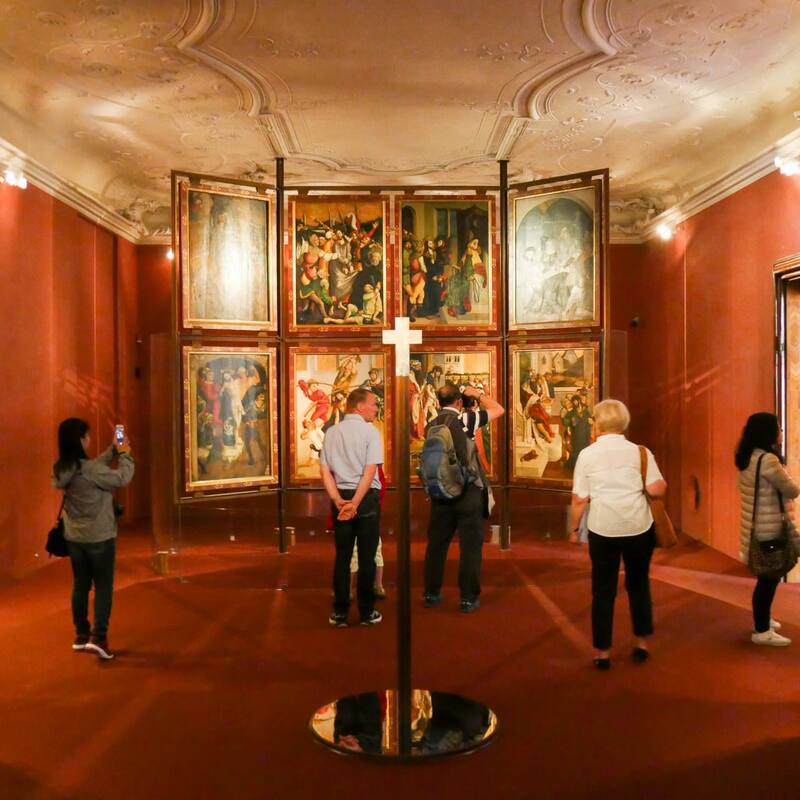 The Daily Cruiser outlines activities offered by AmaWaterways, and we’re free to participate in any of those activities, including tours, as well. So, for example, Alex and I didn’t ride with Backroads on Wednesday. 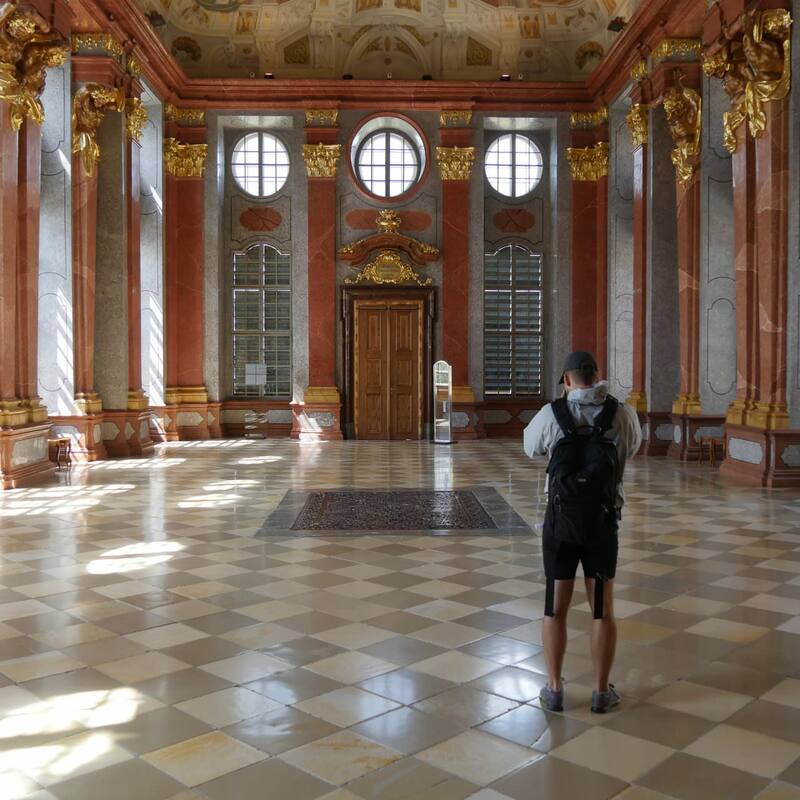 We visited Salzburg instead, which was included as part of the AmaWaterways’ program. 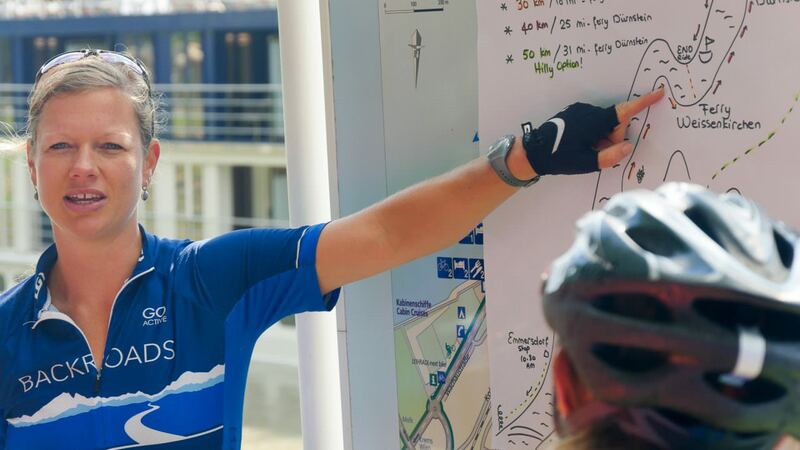 It should be noted also that AmaWaterways also offers complimentary bike tours on its own fleet of bikes. 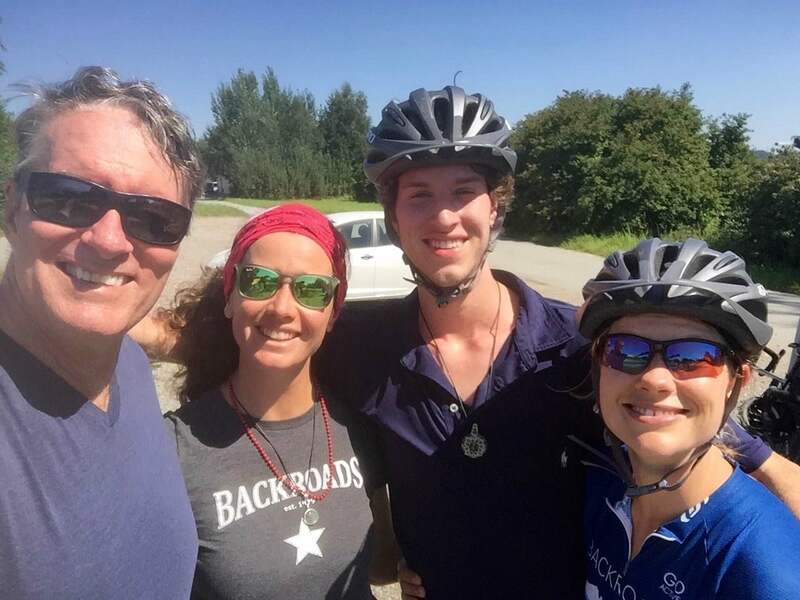 For the serious cyclist, however, the Backroads’ program may be a better choice. 10:30 Route talk out by the bikes or in the ship lounge. 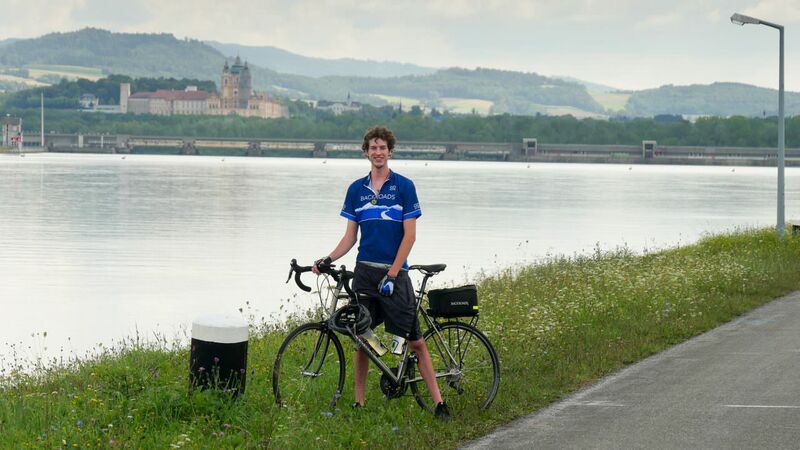 The morning ride takes us on a pleasant loop along the Danube upstream of Melk and Emmersdorf, ending in Melk for lunch and a self-guided tour of the Melk Abbey. 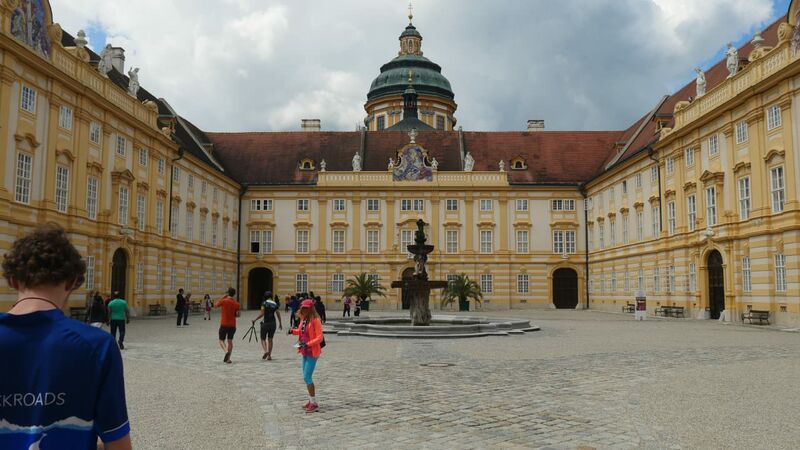 13:00 Afternoon riding and Melk Abbey visit. 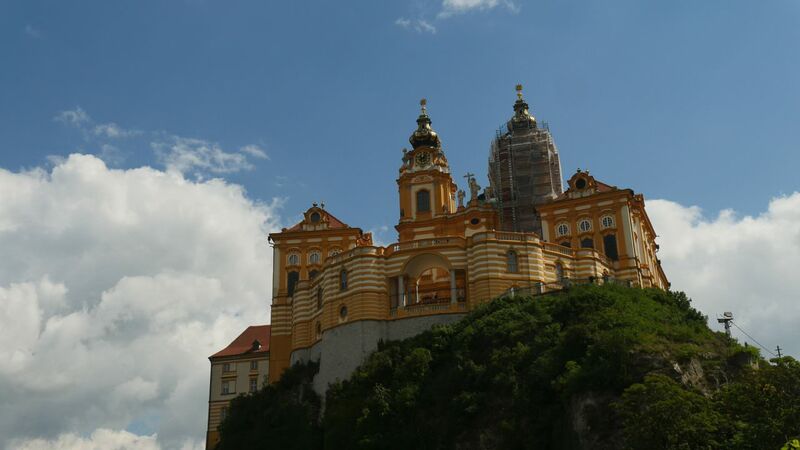 After lunch, visit the famous Melk Abbey. 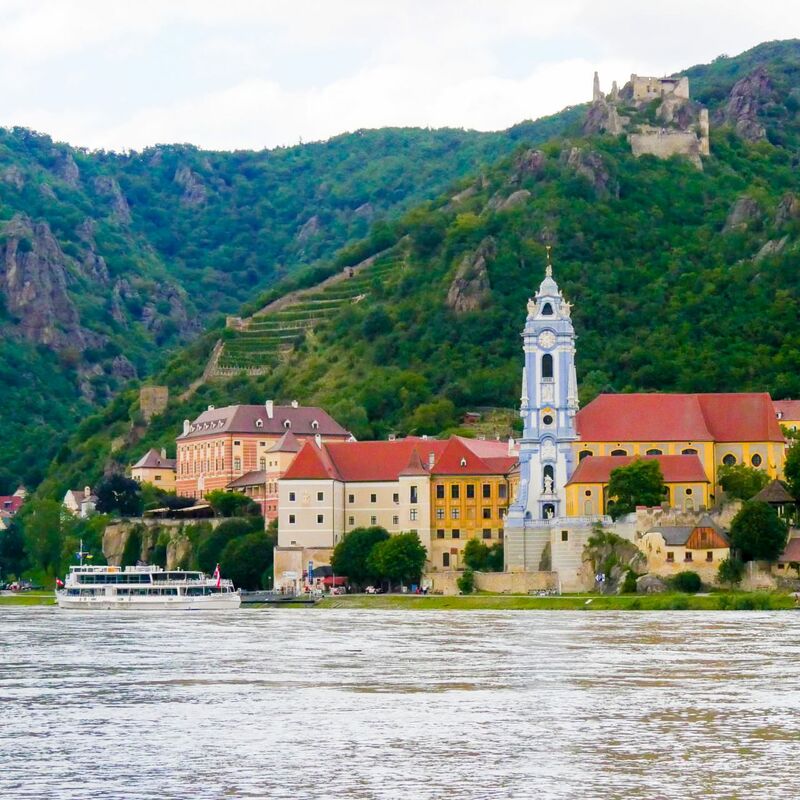 Then ride the scenic Wachau Valley, past vineyards, Heuriger taverns and picturesque towns. A note about the dinner. 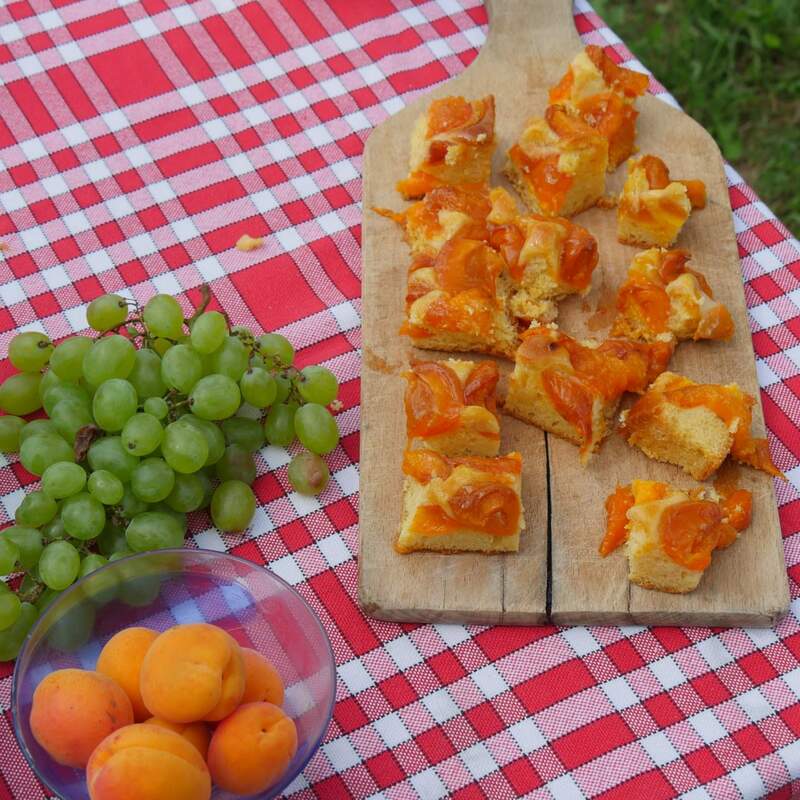 Technically, reserving tables on AmaSonata is not allowed. But anyone is free to head to the restaurant early to claim a table. Our Backroads team leaders are charged with that task. They head down before dinner and save three tables in the back for our group. But again, we’re not required to dine with the group. On our first night on board, Alex and I had dinner in the excellent Chef’s Table, an elegant restaurant situated aft, serving a multi-course dinner with paired wines – all at no additional cost. On other nights, we’ve dined with the group, but even on those nights, some have chosen to go into town to eat, which many did when we were docked in Linz. 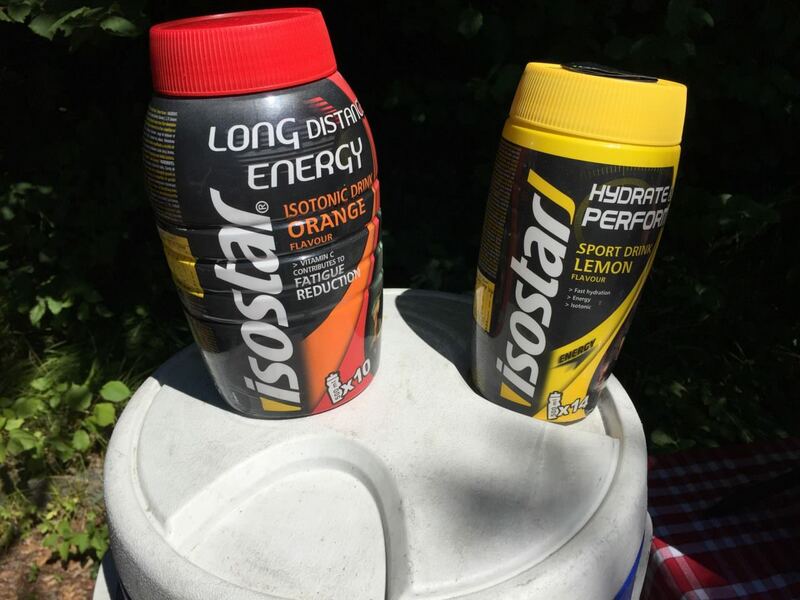 The abundance of choice and the freedom to make the trip our own is refreshing. In addition to outlining the day ahead, the Backroads information sheet highlighted three possible rides yesterday. The Abbey Loop, from Emmersdorf to Melk was mandatory for those riding today, as AmaSonata would be sailing during the morning and afternoon. That loop would cover 18 kilometers (12 miles). Hills Are Alive Route. 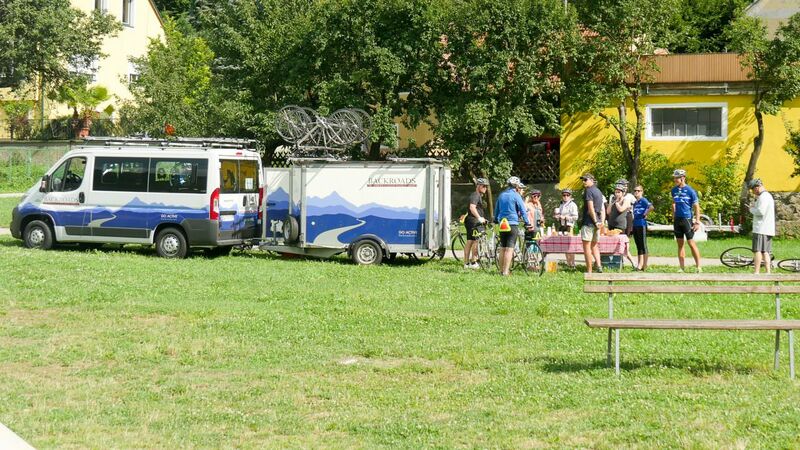 68 kilometers (42 miles), a “hilly ride” through countryside outside the Wachau. Backroads team leaders would elaborate on these routes in the morning, with a whiteboard providing additional details. The organizational aspect and the information provided was exceptionally well done. And all of this came before we started our ride. 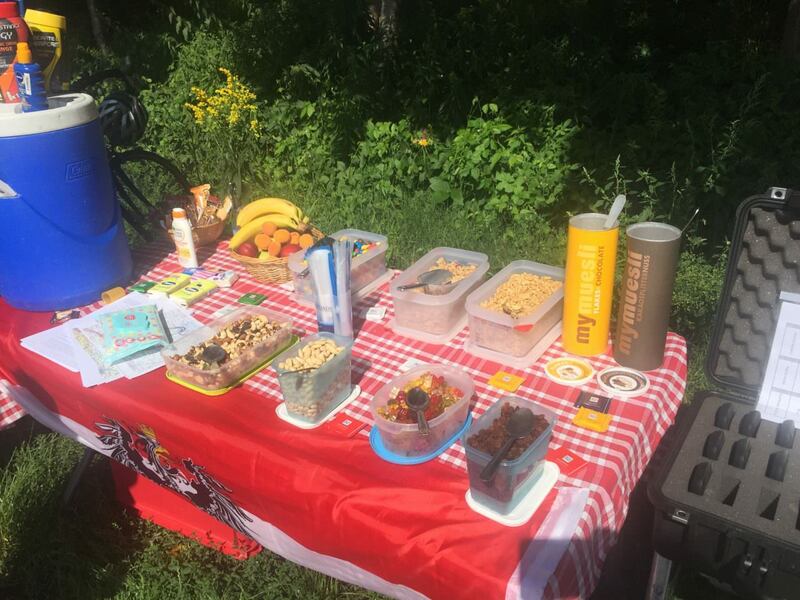 Along the way, we had three things to guide us: 1) the Garmin GPS with our route preprogrammed so that we were instructed where to turn; 2) printed instructions in case the Garmin unit failed; and 3) Backroads teamleaders who were stationed at points throughout the ride. You’d have to work hard to get lost, and even then, we had phone numbers for the team leaders and for the ship. All of these elements, along with the beauty of the landscape, conspired to make yesterday’s ride the best so far. Now, I have pedaled the Wachau Valley several times, but always on the upper side of the river. 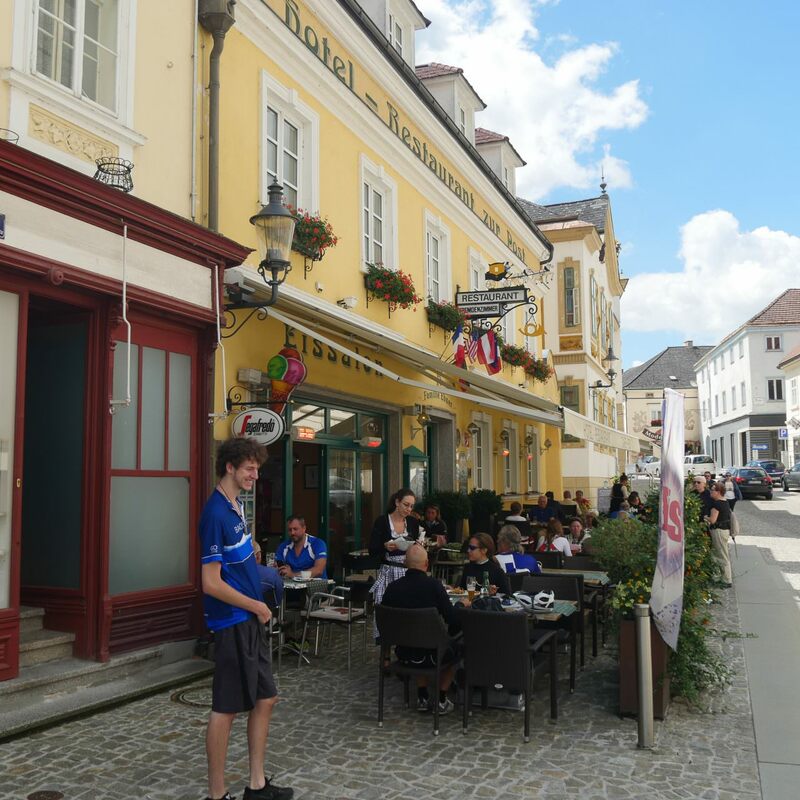 Today, we stayed on the Melk side until we reached Durnstein. It was lovely, with dedicated bike roads for most of the route, mostly flat with some slightly rolling hills. We pedaled through orchards where apples and pears dangled from trees. 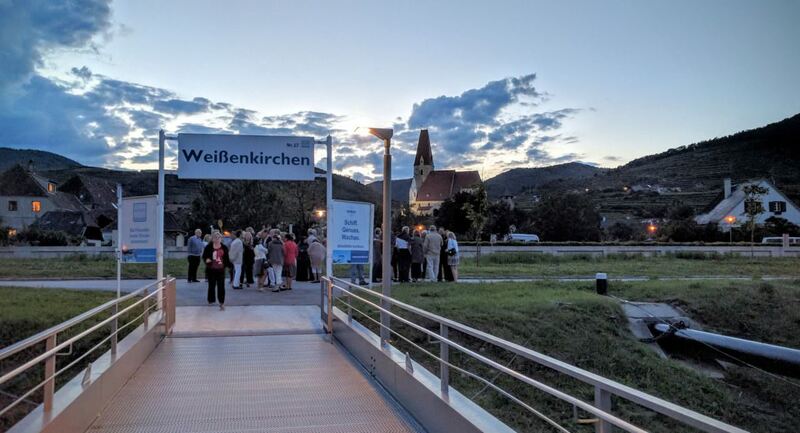 We rode through villages, past wine taverns called heurigers and vineyards featuring the regional Grüner Veltliner grapes and other varietals. On the other side of the Danube, we looked out on vertical vineyards and castles on mountaintops, including Dürnstein Castle, where King Richard I of England (Richard the Lionheart) was held captive in 1192 by Leopold V, Duke of Austria. 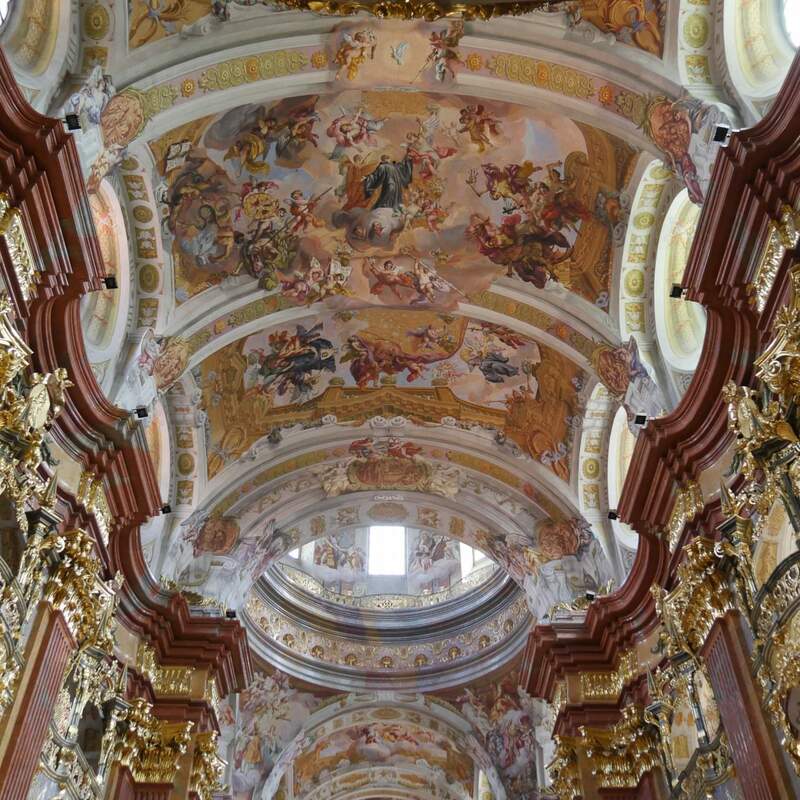 Then there was beautiful Dürnstein itself, with its fairy-tale like buildings along the Danube — and Weissenkirchen, a charming village dominated by a “white” church and where AmaSonata was docked. We boarded a small ferry with our bikes to cross over to Weissenkirchen. 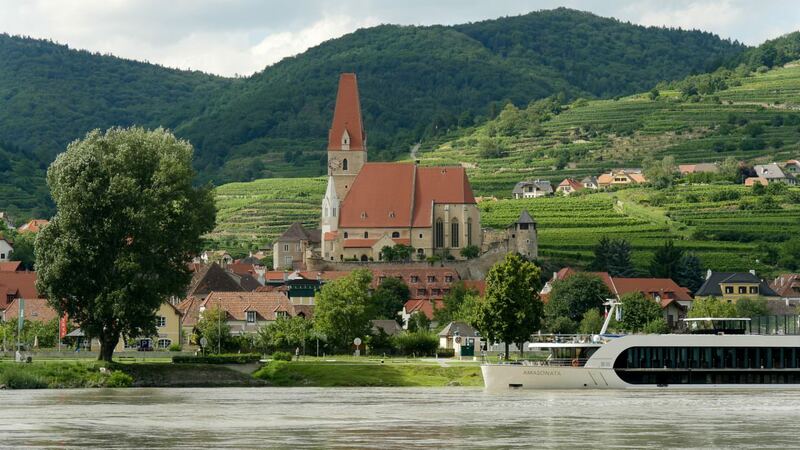 Backroads and AmaWaterways pair almost perfectly to make a seamless experience. The Backroads product is layered on the AmaWaterways product, so that what you have is a program offered by a company that bills itself as “the world’s number one active travel company” coupled with one of the world’s leading river cruise lines with its excellent cuisine, accommodations, service and cultural programs. 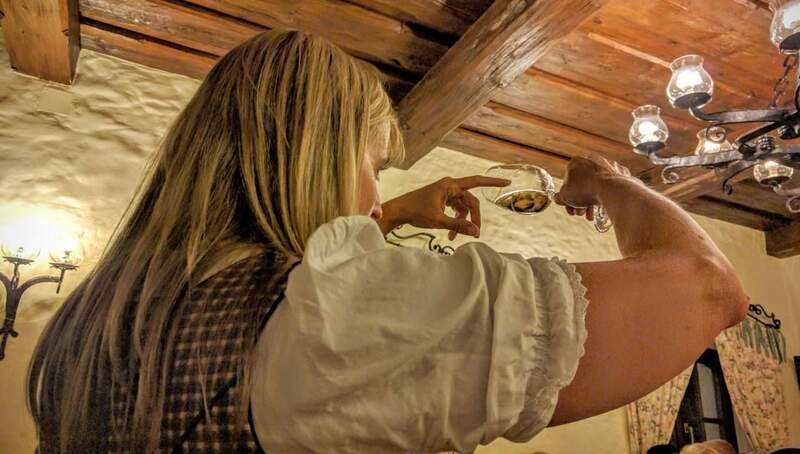 To end our excellent day on the Danube, AmaWaterways hosted a complimentary wine-tasting at one of the local wine taverns. We tasted the wonderful Grüner Veltliners that are made in the Wachau Valley, and other white wines. Our presenter had lived in Melk for 23 years, though she was originally from Vermont. 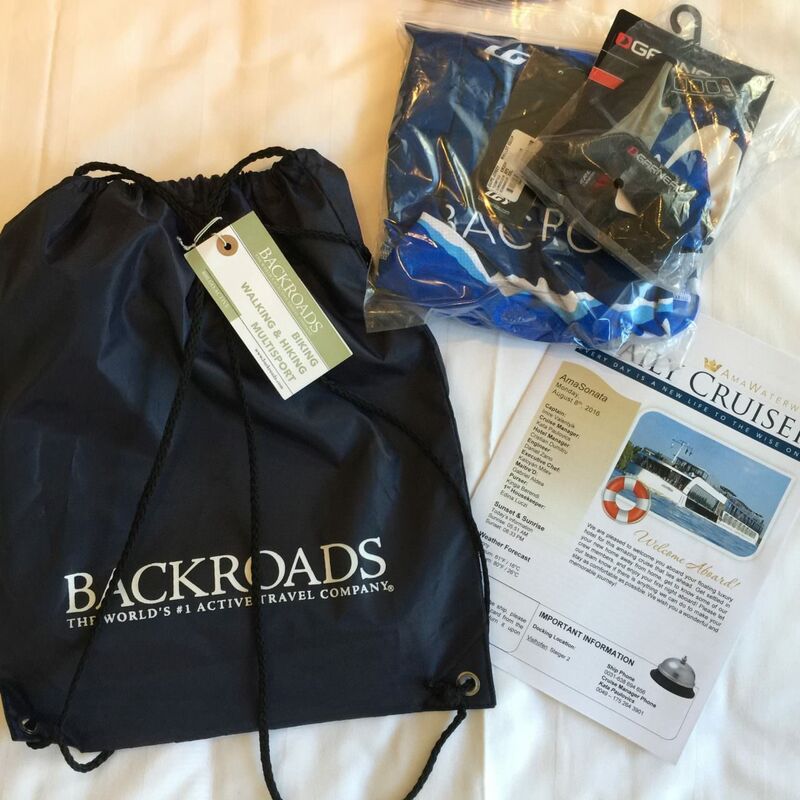 Her presentation was fun and educational, icing on the cake to what had been a perfect day made possible by a partnership between Backroads and AmaWaterways. With three days remaining on our trip, Alex and I both look forward to what comes next. I really like the biking options on your trip, but I was wondering about the weather. We got back home last weekend after the maiden voyage of Regent’s Explorer. In our two weeks around the Med, the weather was hot enough to make me not too enthused about a long bike ride. Was that an issue for you on this trip? We are off next at month-end for a voyage on the Elbe with Viking (no bikes there, darn) and it looks like low water may be a problem. 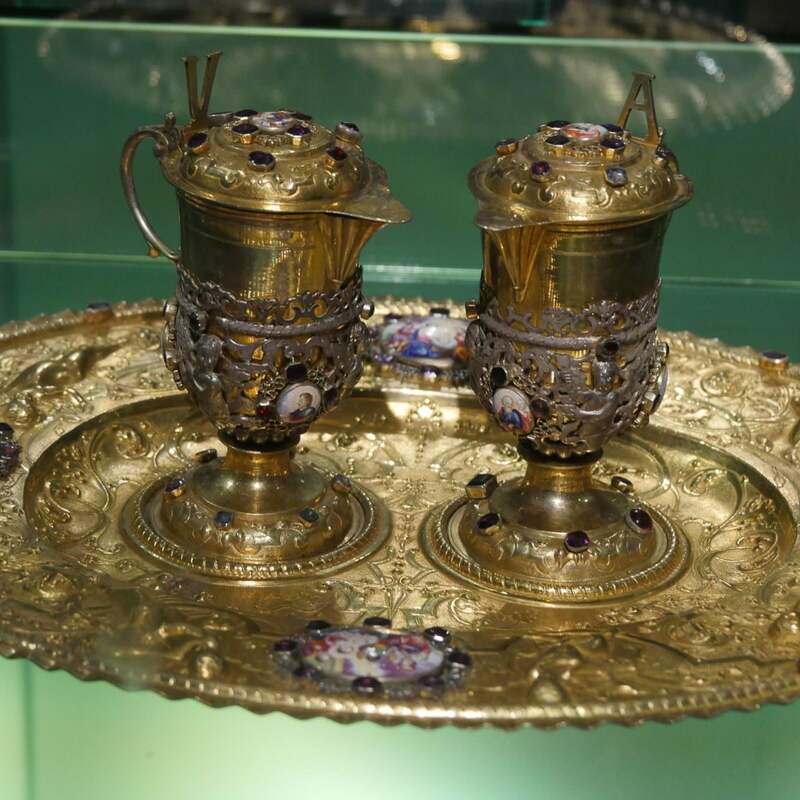 Too bad we can’t steal some from the Danube. Not so much fun parked on shore taking buses. Thanks again for the reporting and pictures. You tilt our future travel plans regularly. made it sound like the trip that we’ve been dreaming of. 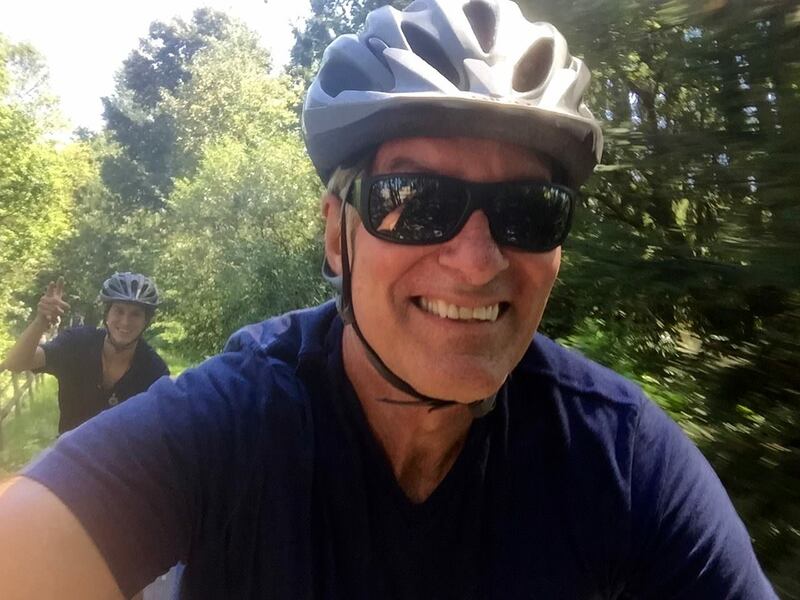 AMA and Backroads seems like the perfect combination.Please keep including all your pictures. Thanks. Thanks for the updates, water looks high…….any concerns about low bridges?! No concerns at all. We were completely unaffected by the water levels.